The biggest problem a large organization has is to present its breadth of programs and opportunities to a variety of different types of people. 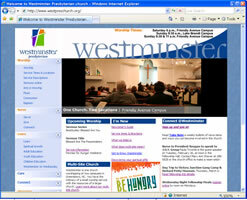 A church's web site is no different. This dynamic church updates its web site daily with the different events and wanted to leverage the ability to communicate with members and visitors online at the web visitor's convenience. The site was reorganized to appeal to the two main audiences and their needs. One audience is the visitor or "church shopper" who came to the site to learn more about Westminster. A Newcomers Guide was put on the home page with links to all the logistics visitors need and online sermons a web visitor could read or listen to online. The second audience is the member or long-time visitor who wants to know what is going on in the church. Almost every event offered at the church allows for online registration for those who either missed a service or who decided later in the week to attend an event. Breaking down obstacles and barriers that prevent people from getting involved was one of the main goals of the site's revised design. Visit the site at http://www.westpreschurch.org or read more about this project. We love to have the chance to work with our clients again. 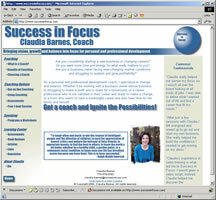 Claudia Barnes, founder of Success in Focus that later became Career & Balance, was niching her career and personal coaching firm to specifically target career-minded women (moms in particular). She wanted her web site to clearly communicate -- in street language rather than coaching jargon -- that her company provides the tools, support and structure in helping women find balance in their work, family, and life. Having worked with Barnes -- for just programming -- we were thrilled to be able to create a new look and feel that captured her energy. We restructured her site to give the visitors the option to explore what Career & Balance can offer them depending on what help the visitor needed: Figuring it out, Making it happen, and Making it work. On each page, there are links to supporting information specific to the topic discussed. We created the site map based on what brought in revenue and what information a visitor would need to move from the learning process to a decision making process. Layered on the site map were user scenarios of three typical web visitors in the target market. Of course, the site had all the programming functionality that we had created in her previous web site: newsletter sign up, a protected area to create and send the newsletter, links to Amazon for the recommended books, and "smart" email links. See www.careerandbalance.com. This executive consulting company has an alliance partnership with Tom Peters Company and wanted to take advantage of the traffic that would be coming from TomPeters! web site. On the Leadership i2i site, the visitor could not only learn about the deliverables offered, but the experience and values that Leadership i2i brings to each engagement. Experienced Designs provided marketing, design, programming, hosting and search engine optimization services. 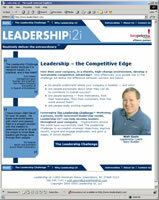 See www.leadershipi2i.com web site. Experienced Designs also made the web site easy for its owners to update and keep current as well as linked them to revenue-generating sites. 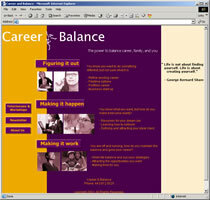 The web site has changed to www.careerandbalance.com web site. They provides healthcare products for the clinical diagnostic and alternative medicine market segments. While steeped in experience in the international healthcare industry, PDx International was just starting out and needed a web site to brand their image and begin to collect sales leads. Experienced Designs provided marketing, design, programming and hosting services. 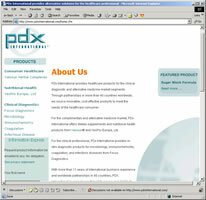 See www.pdxinternational.com web site.